Kola Waste’ is a 14 hand short backed, minimally withered , compact spanish mustang, i do not ride very often with a breast collar & never tried a crupper , although there have been a couple of steep down grades i feel a crupper would have helped a bit , as the saddle with my weight wanted to slide forward a bit…but these grades were extremely steep where the horses but was well above his head…all other hills with gradual declines, we never had an issue, only the STEEP ones! 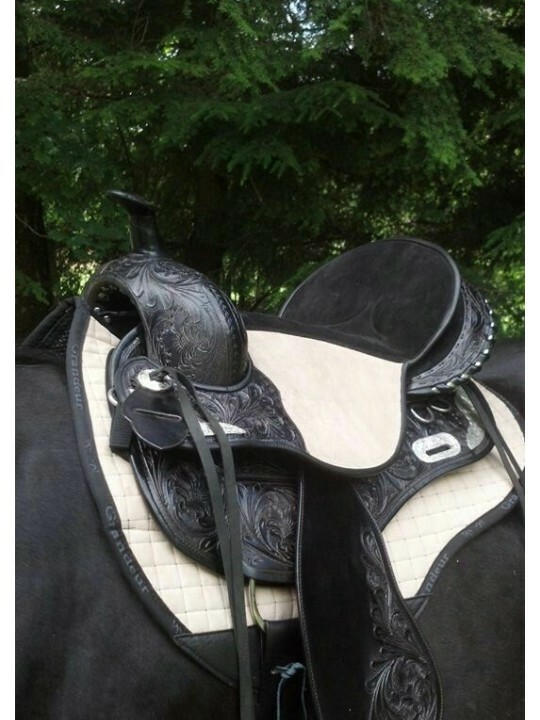 The town & country has a suede underside which is great as it really sticks to the pad you are using, has enough d-rings for my liking, real nice contact with the horse..not nearly as bulky as many of the other treeless saddles i have tried. The seat just hugs you in and i have never come home sore, i feel my horses every move and even tho i have been riding for 30 years, i feel my riding skills have improved even more 🙂 My only suggestion is that if you are new to riding treeless & you get a town & country, to either wear some suede chaps or request the suede seat cover from the company as the leather seat can feel a bit slippery until you are used to it.